Santa Rosa and Sonoma County officials are now in the post mortem phase of the North Bay fire storms, asking what could've been done to avoid the tragedy and what can be done in the future to prevent similar conflagrations. Discussions largely have focused on tighter zoning and fire ordinances. Those are appropriate areas to focus on, say many wildfire experts, but municipalities and counties inevitably face pressures that make effective wildfire risk reduction difficult. As Santa Rosa newspaper columnist and Sonoma County historian Gaye LeBaron has written, the Tubbs Fire that ravaged Santa Rosa could've been predicted; in 1964, another wildfire followed almost the exact same path. But that earlier fire burned mostly forest and agricultural land. Fountaingrove's pricey developments weren't put in until the 1990s, rammed through by local officials anxious for the tax revenues, and in apparent violation of an ordinance that proscribed development on ridge tops overlooking the Santa Rosa Valley. How? McBride believes that it would be wise to divest cities of some of their regulatory authority and place it with the state. State agencies, he observes, are largely immune to both the blandishments and intimidation of local development bigwigs and are motivated by larger issues than municipal and county tax bases. He points to the California Coastal Commission as a promising template. Prior to the Coastal Commission's formation in 1972, development pressures along the state's incomparably beautiful coastline were increasing dramatically. It seemed certain that California's future would include a solid wall of strip malls and gimcrack bungalow developments from Crescent City to San Diego. Both Stephens and McBride think certain types of ornamental trees should be minimized — even eliminated — from the urban landscape. Grasslands and native oak savannas burn readily, says McBride, but at a low intensity; grass fires can usually be countered relatively easily by firefighters. But some exotic trees, particularly eucalyptus and Monterey pine, are impregnated with oils and resins that burn explosively, often producing flame lengths of 200 feet or more and creating “spot” fires miles from primary blazes, making effective firefighting impossible. Indeed, says McBride, modern architects and urban planners can learn about a lot about minimizing fire risk by studying some of the historic structures from California's past. Last week's wild fire on Grizzly Peak Boulevard ended up scorching about 20 acres of brush and grass near the Lawrence Berkeley National Laboratory, with no major damage to property and no loss of life. That was due in large part to a fuel reduction program pursued by Berkeley Lab since the 1990s, says Scott Stephens, a professor with UC Berkeley's Department of Environmental Science, Policy, and Management and one of the country's foremost wildfire experts. “The lab has done a good job of treating blue gum [eucalyptus] stands around their facilities and generally removing or reducing fuels,” says Stephens, noting the ubiquitous eucalypts that grow across the East bay hills are notorious for their flammability. Due at least partially to Berkeley Lab's efforts, says Stephens, the fire never “crowned”—that is, it didn't leap up the “fuel ladders” of brush and branches to the interconnected canopies of the trees, then rage across the landscape. Firefighters also were able to jump on the flames in short order, due in large part to a signage system put in place by Tom Klatt, Stephens' predecessor at Berkeley. But the East Bay Hills dodged an incendiary bullet for another reason, Stephens says: On the day the fire ignited, the weather was mild and a west wind was blowing, more or less pushing flames away from Berkeley Lab and the UC Berkeley campus. If the fire had started on a hot day with an east wind—the conditions that prevailed during the disastrous Oakland Hills fire of 1991—things might have concluded tragically. Many of Berkeley Lab's buildings are heavy concrete structures that could be largely impervious to wildfire, particularly given the aggressive fuel reduction policies the lab has pursued for the past 20 years, Stephens observes. A study led by ecologists at UC Berkeley has found significant flaws in the research used to challenge the U.S. Forest Service plan to restore Sierra Nevada forests to less dense, and less fire-prone, environments. An example of a mixed-conifer forest in the Sierra de San Pedro Martir National Forest, Baja California Norte, Mexico. This forest experienced active, natural fires until the 1970s. (Photo by Carrie Levine). Until recently, the consensus among forest ecologists was that before European settlers arrived in the Sierra, the forests were mostly open conifer forests dominated by big trees and low-to-moderately severe fires every eight to 12 years. The Forest Service recently released a plan to restore the range's forests back to this state following decades of fire suppression and timber harvesting regulations, which have created dense, fire-prone forests. But recent studies, using a newly developed methodology, have argued that the Sierra Nevada was actually a more dense forest than the consensus view. These new studies were used to back a lawsuit to stop the agency's plan to restore Sierra forests following the 2013 Rim Fire. The Berkeley study refutes the conclusions of these studies and identifies flaws in their methods. “We went through the data and showed that, in every case, this method estimated that the density of trees was two to three times higher than was the reality,” said Carrie Levine, a Ph.D. student of forest ecology at Berkeley and lead author of the study. The study was recently published online in the journal Ecological Applications. Berkeley professors John Battles and Scott Stephens and research scientist Brandon Collins were co-authors on the publication. Also involved in the study were researchers from Harvard Forest, the USDA Forest Service Pacific Southwest Research Station, the University of Montana, Utah State University, University of California, Davis, and the USDA Forest Service Pacific Southwest Region. An example of a densified mixed-conifer forest in the Plumas National Forest in Northern California. Fires have been suppressed in this forest for more than 100 years. (Photo by Carrie Levine). When the U.S. was divvying up land in the West in the late 19th and early 20th centuries, the General Land Office performed surveys so that the land could be parceled and sold. Land was divided into square-mile blocks, with markers used to indicate every corner point. In case a marker was moved, so-called “witness trees” near the stake were identified as reference points. The result of this data is a grid survey of the entire American West. Using this historic field data, two ecologists at the University of Wyoming, Mark Williams and William Baker, developed a method that claims to calculate the area that a tree occupies, which is then used to calculate a forest's density. This approach is based on the observation that trees create space to keep other trees from cramming next to them, and that this space correlates to a tree's species and size. To assess the validity of this area-based method of density estimation in the Sierra Nevada, Levine and her co-authors assembled data from plots of mapped trees across the Sierra and Baja California, Mexico. They tested the performance of the area-based method in these mapped stands where the true density was known. Levine and colleagues found that the area-based method has two basic flaws when applied to the Sierra, the most notable being an inability to actually predict the area that a tree occupies based on its species and size due to a weak relationship between these variables. The other flaw was a failure to account for differences in the number of trees sampled at each corner. The methodological flaws led to an inflated number of trees estimated in a pre-European Sierra Nevada forest, Levine and colleagues argue. “We have a mapped plot where every tree is measured, so we know the true density,” Levine said. The study is important not only for the current state of the Sierra Nevada, but for its future. “As climate changes, we want to have an accurate understanding of the past. This allows us to manage for forests that are resilient to the changes we're expecting in the future,” Levine said. Professor Scott Stephens, a fire scientist in the department of environmental science, policy, and management, delivered the opening remarks. He provided background on the causes and magnitude of tree losses happening across the state. "Our forests are not in a resilient condition," he said. "Past management actions, including fire suppression and logging focused on large trees have produced forests today that are much more vulnerable to fire and drought-related mortality." 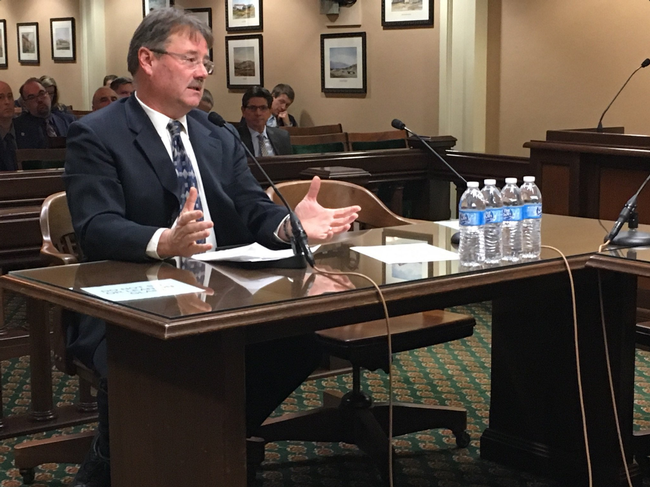 Stephens made suggestions for legislation, policy, and forest management techniques that could help restore resilience to California's forest ecosystems and prevent future mortality crises. He also offered ideas on how the state could better work with private landowners as well as the federal government to promote healthier forests. After a three-year, on-the-ground assessment of the park's Illilouette Creek basin, UC Berkeley researchers concluded that a strategy dating to 1973 of managing wildfires with minimal suppression and almost no preemptive, so-called prescribed burns has created a landscape more resistant to catastrophic fire, with more diverse vegetation and forest structure and increased water storage, mostly in the form of meadows in areas cleared by fires. “When fire is not suppressed, you get all these benefits: increased stream flow, increased downstream water availability, increased soil moisture, which improves habitat for the plants within the watershed. And it increases the drought resistance of the remaining trees and also increases the fire resilience because you have created these natural firebreaks,” said Gabrielle Boisramé, a graduate student in UC Berkeley's Department of Civil and Environmental Engineering and first author of the study. The study is published in the current issue of the journal Ecosystems. “I think it has the potential to change the conversation about wildfire management,” said co-author Scott Stephens, a fire expert and UC Berkeley professor of environmental science, policy and management who has studied the Illilouette basin since 2002. This “wildfire management” strategy is counter to the federal government's 110-year-old Smokey Bear policy, which is followed throughout the West and emphasizes suppressing fires wherever they occur for fear they will get out of control. With persistent drought and a warming climate, the U.S. Forest Service budget is increasingly going to firefighting. On most federal land, only forest thinning and human-initiated prescribed burns are allowed as a way to manage the trees and underbrush. Stephens noted, however, that these agencies have recognized the folly of total suppression — thanks in part to his own studies throughout the Sierra Nevada over several decades — and current draft wildland management policies for three of the state's national forests allow active wildfire management in up to 60 percent of the forests. Graduate student Kate Wilkin gathering data in the field in the Illilouette Creek Basin, which bears the scars of many natural fires. Gabrielle Boisramé photo. These fire-caused clearings, however, act as natural fire breaks and make the area resistant to catastrophic fires such as the 2013 Rim Fire in the western part of the park, which burned 250,000 acres and left patches up to 20,000 acres in which not a single conifer tree survived. These areas could take a century to recover, Stephens said. Even if these wildfire management techniques don't produce more runoff, Thompson added, “I think it is a fabulous result in terms of forest management if you end up with a healthier forest with some better intact aquatic habitat, even if you don't see a drop of water further downstream. It is still the right thing to do from an ecological point of view. “Bottom line, this strategy might be a triple win-win-win for water, forest structure and fire risk,” she said. The findings are the culmination of a 14-year study led by Stephens and his UC Berkeley colleagues to learn how monitoring natural, lightning-caused fires with a bias toward letting them burn affects the landscape, the vegetation and the groundwater. Only four areas in the western U.S., including two in California — the Illilouette Creek basin and the Sugarloaf Creek basin — have allowed lightning fires to burn in large areas for decades. Most studies of different ways to manage wildland fires have been limited to a few hundred acres, and it's hard to extrapolate from such limited experiments to an entire forest. Luckily, Yosemite National Park started its experiment in 1973 — spurred by a 1963 report authored by the late UC Berkeley forester Starker Leopold — to let nature take its course in the Illilouette Creek watershed, stepping in only when fires in the basin threatened to get out of control or sent too much smoke into Yosemite Valley two miles to the northwest. One reason the basin was chosen was that it was surrounded by granite walls, which naturally prevented fires from spreading outside the basin. It had not been burned by the indigenous tribes of the region, which often set fires to increase acorn production, and had no history of prescribed burns. In fact, it saw only natural, lightning-caused fires except for an interval of nearly a century — 1875 to 1972 — when the park suppressed all fires. Boisramé, who spent the past four summers sampling and camping in the Illilouette Creek basin, emphasized that this is not a strategy that would work everywhere. But in wilderness areas where wildfire management is being considered because of its safety benefits — to reduce underbrush and eliminate fuel for out-of-control and catastrophic fires that risk lives and property — the ecological and hydrological benefits are a big bonus. Areas with similar elevation and climatic conditions to the Illilouette basin, and thus perhaps suitable for managed wildfire, comprise about 18 percent of the Sierra Nevada, though the strategy may work at lower elevations as well. “The whole ecosystem will be better off if we let the natural fire process back in,” she said.